The Chicago Force (2-0) won its home opener in the WFA beating the Columbus Comets (0-1) 47-0 on Saturday night at Evanston High School. 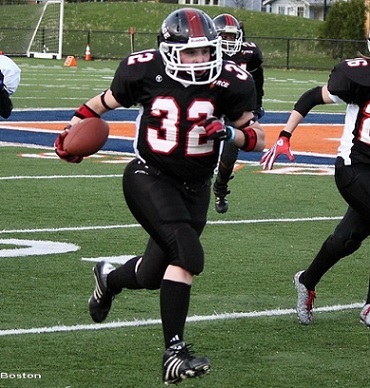 Running back Melissa Smith led a balanced offensive attack with three touchdowns and 125 yards rushing, and was named the Offensive MVP of the game. The Force, behind solid offensive line play, ran for 247 yards while completing 17 passes for 187 yards. Quarterback Sami Grisafe completed 13-of-22 passes for 158 yards and two touchdowns. “It feels good to be back (on the team),” Smith said of returning to the squad for the first time since 2008. Football is the ultimate team sport. Konecki was pleased with both sides of the football as the defense limited the Comets to minus seven yards rushing. Columbus had three turnovers and finished the contest with only 90 yards of total offense. The defensive effort was led by Darcy Leslie, Kim Marks (named Defensive MVP of the game), Amber Burns and April Fowlkes. “I feel good about this team,” added Konecki. The evening began with Chicago Bears defensive end Israel Idonije performing the ceremonial coin toss before taking pictures and signing autographs with fans. “This is the first women’s football game that I have attended and I was very impressed,” Idonije said. The Force scored on their first possession at Lazier Field as Brandy Hatcher capped a 62-yard drive by scoring on a two-yard run. Smith scored on a 16-yard run in the second quarter for a 14-0 lead as Grisafe threw a pass to Jeanette Gray for the two-point conversion. It’s hard to say one play could make a difference in a 47-0 game. However, the complexion of this game might have changed when Grisafe threw a 37-yard touchdown pass to Elizabeth Strozinsky on the final play of the first half. The Force was never in trouble as Smith scored twice in the third quarter, and Grisafe added an eight-yard touchdown pass to Brandi Srda in the fourth quarter. Rookie Mary Choules came off the bench to end the scoring on a one-yard run. Choules rushed for 52 yards on 10 carries. The Force is off to a good start.